Learn more about The Mikes Bike's Foundation's Africa Projects from CEO, Ken Martin. 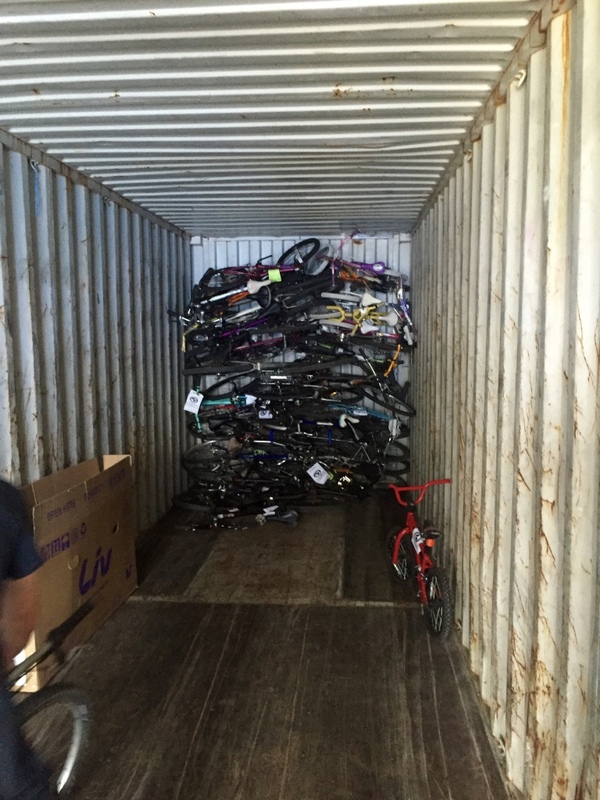 Another container of donated bikes from San Diego! Our good friends at Bicycle Warehouse in San Diego have come through with yet another container of bikes for Africa! A while back, Ken challenged Debbe and Mike Simmons from Bicycle Warehouse to run their own San Diego bike drive to support our projects, and they jumped right on board. They shipped off their first container, and it was mission accomplished. Except they didn't stop there. They kept the bike drive going, and have rounded up another batch of 400+ bikes, which they packed into a 40 foot shipping container this week (our 51st container to Africa), and it's now en route to our partners in Lesotho, where the bikes will be distributed by Tumi's Cycles in the capital of Maseru, as well as a new one there name Teboho's Bike Shop. Cycling in Africa is flourishing thanks to our donors in SF and SD, and our incredible partners like Mike and Debbe. THANK YOU to the entire crew at Bicycle Warehouse!! First progress report from Kenya. All indications positive! Our awesome new partners in Kenya are calling their project the Bicycle Enterprise Development Programme. With near perfect alignment with our own goals at the Mike's Bikes Foundation, they're all about creating sustainable employment in the cycling industry in Kenya through "starting more bicycle enterprises and/or making sure the ones that are already existing are sustainable in the long run by regularly supplying the shops with resources." Through the project, they're also promoting the use of bicycles through doing regular events, training youth in mechanic skills, and improving access to cycling equipment and services around Nairobi, and eventually, all of Kenya. 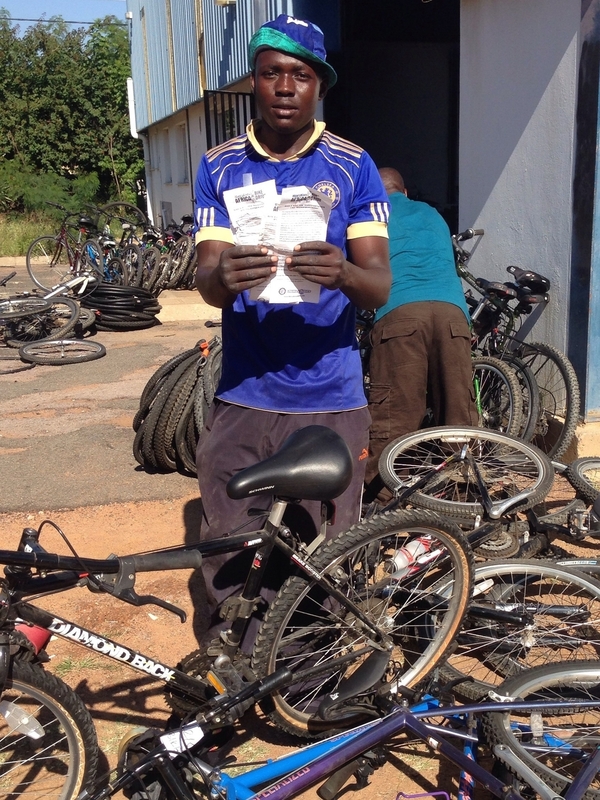 Mirroring our successful model in Botswana, Fredrick and his team in Nairobi are partnering with both existing and new locally-owned community bike shops to step up their game, and to maintain regular supply of used bikes and equipment. Fredrick says it best: "In short we are saying, the more bike shops we have in Kenya, the easier it becomes to access affordable equipment, accessories and services, which also makes the use of bicycle more convenient for people, therefore making more people to use the bike. This will create more employment directly and indirectly and therefore also contribute in the reduction of poverty. And also when many people take up cycling our environment becomes safe due to reduced air pollution." We really love these guys!! In the pictures below, Fredrick's group, Cycloville Kenya, are distributing to local bike shop owners, and also directly to some local residents in the Mathare slums. Cycloville has known many of the more established shop owners before, but the shops lack adequate finance to purchase the bikes for resale. In these cases, Cycloville is providing a micro-lending structure, as well as mentoring and monitoring on best practices for running a successful shop. The green container from Mike's Bikes is being modified into a workshop and local bike store. It will become a Bicycle Enterprise Development Center where Nairobi youth will be trained about mechanics and basic business skills to run bike shops. We couldn't be more proud of the quick progress made by our incredible partners in Kenya! The community comes out to help unload the container. When one of our containers lands in a new community, the local folks tend to react with a certain exuberance. Looks like Nairobi was no different. Big green container arrives in Kenya! Very happy to report that our first ever shipment to Kenya has arrived safe and sound. This one was unusually challenging, as Kenya has extremely "unique" requirements for inbound bikes, even donated ones. Through a pretty rigorous inspection process on the US side, we managed to pre-clear those hurdles, and our partners on the ground in Nairobi shepherded the container through Kenyan customs. After a long journey from Oakland to the port of Mombasa, and then overland up to Nairobi, the container was placed using the now-familiar "crane method" in its final location just outside of town. Fredrick and his team were ecstatic to finally see this big green can rolling into town, and they're super excited to get to work on the bikes inside. Container #47, and a brand new country for us - Kenya! As usual, our customers donate their old bikes at local Mike's Bikes stores, those bikes are brought to our HQ in Novato, where they're loaded into 40' shipping containers as they arrive. Typically, we gather up 450-550 bikes, seal up the container, and off it sails. However, as we prepared to do this for our new partners, Cycloville Kenya, we were informed at the last minute "By the way, Kenya Customs requires that you conduct a pre-inspection of the goods here in the States." Oh, well that couldn't be too hard, right? Wrong. It requires that the container be completely unpacked and offloaded so that each bike was viewable, and some bizarre and frankly ridiculous Kenya law requires that every used bike entering the country include a lock and a bell! We very nearly bailed entirely on the Kenya project, but finally decided to power through and give it a go. So we ordered 400+ locks, 400+ bells, scheduled the inspection, unloaded the entire shipping container one morning, somehow cleared the inspection mid-day, and reloaded the entire container in the afternoon. We're still trying to figure out how to handle the logistics of this for the next Kenya container, but now, container #48 is loading up gradually and destined for our usual partners in Botswana. A note from Tumi about the bike distribution. On 23rd February, 26 bicycles from donors of Mikes Bikes and Bikes for Lesotho were donated to 3 cycling clubs to motivate needy kids that lack bicycles in their clubs or village, and 20 cycling shorts and 20 jerseys were donated on behalf of donors from Lesotho Sky. Yesterday 10 bicycles and parts were donated to needy kids from Thamae village. 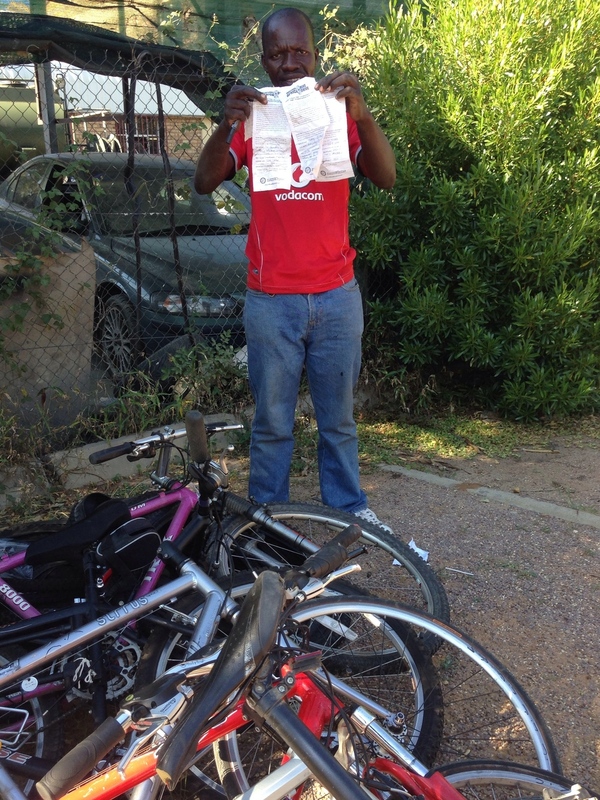 About 30 bicycles are left at Tumi's shop, these bikes are to be distributed to Qacha's Nek district for needy kids. Please be aware that with your good contribution of your bikes that you donated to the container to Lesotho, brought the change of life to more than 600 kids that were showing tears of joy when receiving your bike. I (TUMI) on this project of handing over bikes to needy kids, has been my great time and this has also built a great relationship with kids, together with their parents. It's amazing about containers of bicycles have entered into a small country like Lesotho because of you American people. I also thank the relationship that I have with Mikes Bikes Foundation because this could have not happen. The first batch of donated bikes from the 2nd container of the "Jeff and Dave" project were delivered today. 20 kids in the small village of Koalabata, Lesotho were thrilled with the arrival of their new rides. Also delivered were fabric dolls hand-sewn by ladies in a Chicago nursing home. Jeff and Dave's Kiwanis club has sent these dolls to other countries too, along with pens and markers to decorate them. Not our typical delivery, but hey, why not? These bikes were donated by Working Bikes in Chicago, transportation covered by Jeff and Dave's fundraising efforts, logistics and backing provided by The Mike's Bikes Foundation, on-the-ground unpacking, refurbishing and distribution by Tumi's Cycles. It takes a village to help a village! "Where did my donated bike go?" To the UCI Worlds, of course! In what may be the best example yet of used bikes getting a second life in Africa, this beautiful old Trek 930 was donated by one of our customers here in NorCal (was it you? ), and later turned up at the 2013 UCI World MTB Championships in South Africa, ridden by Lesotho rider Thuso Makatise. (No joke!) For Thuso, this was a lifetime dream come true! THANK YOU to whoever donated this bike - you've changed a life in a way you probably didn't intend. Thuso Makatise representing Lesotho at the 2013 UCI World MTB Championships in South Africa, with a bike donated through the Mike's Bikes Africa Bike Drive.